...I could really use some help from someone with experience in Penepma .geo files to create a .geo file for 3 materials for us with a geometry shown in the attachment below. The idea being that we could run it twice, once with epoxy as the matrix and a second time with SiO2 as the matrix. The materials are arbitrary, we just need help with creating the .geo file. The beam position could be varied but normally we'd put it in the center of the 20 um inclusion. Does anyone have a file of this (or similar) geometry that they can share with us? I think this should work (see attachment). I shifted the TiO2 inclusion by 40um, so a beam at (x=0, y=0) hits in the centre of the SiO2 inclusion. Thank you for your help! It is much appreciated. Just a quick clarifying question - is the TiO2 inclusion shifted 40 micron with respect to the edge of the sphere or the center of it (i.e. is the center or the edge of the TiO2 inclusion 40 microns from the center of the SiO2 phase?) ? Therefore we're seeing only about 1-2 PPM SF effect from a 5 um TiO2 particle 40 (37.5) um away from our beam spot in SiO2. I have to admit, it surprises me a bit that at 7.5 um from a 5 um particle and we're only getting 30 PPM of SF effect. Can anyone confirm these calculations? Someone might wonder where the matrix correction of ~1.2 comes from. Well it's a good question because while the matrix correction for 15 keV, Ti Ka in SiO2 is ~1.2, one might note that in this case the Ti Ka emissions are *not* coming from the SiO2 inclusion, but instead they are emitted from the TiO2 inclusion, which is 37.5 um away from the SiO2! So we might use a matrix correction for Ti Ka in TiO2, which is roughly 1.08. But in this context of secondary fluorescence I'm not exactly sure what it means to even have a matrix correction for the SF emission. This is why in the Penfluor/Fanal calculation plot we show the concentrations calculated two ways, because I'm not exactly sure how the matrix correction should be applied. Because, let's be honest, secondary fluorescence is not electron-solid physics, it's x-ray fluorescence! Perhaps just a simple absorption correction for the fluoresced matrix? Now one might ask: why do we even care about the "apparent" concentration of the secondary fluorescence? The only reason is because our analysis results will assume the concentration is emitted from the beam incident matrix, and will therefore apply the matrix correction for that matrix. The 40um is from the center of each half-sphere. This distance is defined by the x-shift of the TiO2 inclusion. We modified and renamed the .geo file to obtain a distance of 40um between the boundaries of the inclusions by setting the x distance of the TiO2 inclusion to 52.5 um (0.525E-02 cm) as seen here highlighted in red. That is, 40 um plus 10 um radius for the 20 um SiO2 inclusion plus 2.5um radius for the 5 um TiO2 inclusion. The renamed .geo file is attached below. Attached below are the 10 and 20 um distance (edge to edge) between the TiO2 and SiO2 inclusions .geo files. Hopefully on Monday I can post a small table with the results. I thought I would share how Marisa and I manually edited the Penepma .in input files to work with Penepma .geo files containing three materials. This manual editing is necessary because the Penepma GUI in Standard only supports one or two materials. This two material limitation covers most modeling situations, e.g., a single phase (bulk.geo), a SF boundary fluorescence (couple.geo), a thin file on a substrate (bilayer_200nm.geo), and an inclusion in a matrix (50mic_sphere.geo). The reason for not supporting more than two materials in the Standard GUI is that the possible configurations gets complicated, and so it was decided to limit the Penepma GUI in Standard to two materials. But we can add a third material to the Penepma .in input files manually using a text editor, and then still be able to run these input files from the Penepma GUI in Batch Mode, which automatically copies each completed simulation to a specified subfolder for subsequent review and/or k-ratio extraction. But first let me mention that after manually modifying the Penepma .in files for a third material and then reloading the modified .in file into the Penepma GUI, we discovered a small bug that caused an error message about a missing control index (for the manually edited third material). 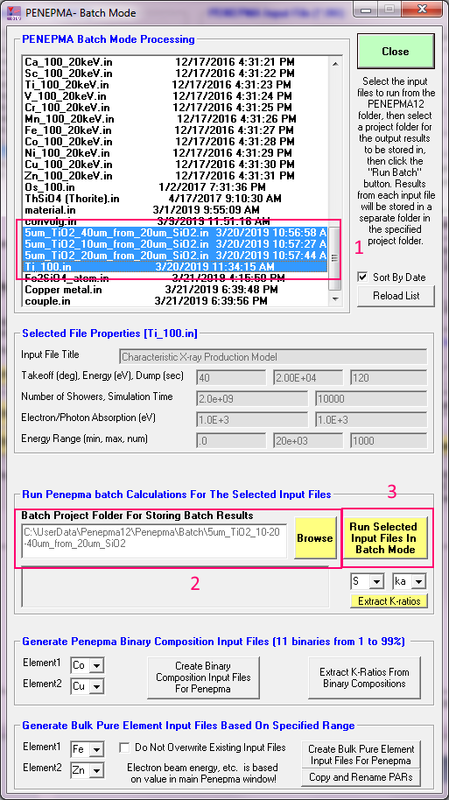 This bug still allowed the batch mode option to run the simulation, but one had to "click through" the error message for each .in file containing more than two materials. 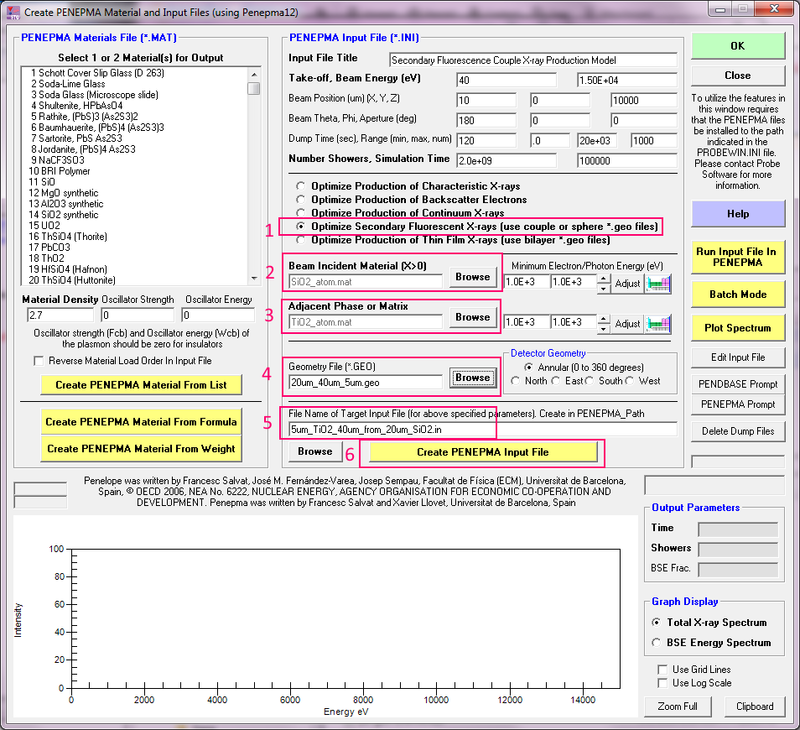 The current version of the Penepma GUI in Standard (update to PFE and CalcZAF v. 12.6.0) now handles three materials for running in batch mode. But please note that loading a manually edited three material .in file into the Penepma GUI (by using the Browse button), and re-saving that .in file, will cause the third material to be excluded from the saved .in file. Bottom line: don't click the Create PENEPMA Input File button if your .in file contains more than two materials. Or if you do, simply re-edit the .in file afterwards, by adding the third material manually, as I am about to describe below. So, let's start by looking at a three material .geo file, specifically the one created by Philippe Pinard for two inclusions (each a different material) separated by a specified distance, in a matrix (a third material). The lines highlighted in red above, indicate which material is assigned to each geometric body. In this particular .geo file, material 2 is the TiO2 inclusion (separated from the SiO2 inclusion by a non-zero distance), material 3 is the SiO2 inclusion (centered on the incident beam when the beam incident X/Y distances are zero), and material 1 is the matrix (SiO2 or epoxy). Note that these three geometric bodies could be any material (as defined in the .in file), and the comments in the .geo file are simply there to assist in their identification in the .geo file. By the way, these .geo files are normally saved to the C:\UserData\Penepma12 folder. >>>>>>>> Material data and simulation parameters. >>>>>>>> Geometry of the sample. >>>>>>>> Photon detectors (up to 10 different detectors). In this case material 1 is the first material (SiO2), and material 2 is the second material (TiO2). These material designations could be reversed if the beam incident and boundary materials were swapped in the Penepma GUI. Note that if one has utilized different SIMPA values for each material, you will want to move those lines along with their corresponding MFNAME lines. But in this case all the minimum electron/photon energies are 1 keV for all three materials. It's so *simple*... seriously though, it's a lot simpler than editing everything by hand, and besides, the two material GUI works for almost all modeling situations. And you didn't forget the specify the correct beam energy in the .in files for all the models, right? "Ti ka in Sample" "Distance or Radius (um)" "Std.Tot.Int." "Unk.Tot.Int." "Unk.Tot.Int.Var." "K-ratio" "K-ratio Var." So about the same (~ 1/2) as we got for an SiO2 matrix (at 15 keV), but the distances were a little different so I'm going to re-run the SiO2 matrix simulations with the correct distances and at 20 keV again over the weekend so we can compare apples to apples. By the way, I'm sure others have already thought of this, but it just occurred to me that if one acquires the Ti signal on *all 5* WDS spectrometers (for ultimate sensitivity as Marisa is doing in her trace element measurements), then the Penepma simulations are actually somewhat more applicable to these WDS measurements because there won't be such a Bragg defocus effect as reported in Ben Buse's paper on this. Because, the Penepma secondary fluorescence simulations don't account for WDS Bragg defocussing. So acquiring a trace element on all 5 WDS spectrometers reduces the uncertainty from the direction of the fluoresed phase (or boundary) being at different orientations from the fluorescing phase. So acquiring a trace element on all 5 spectrometers is almost sort of an annular WDS detector! Edit by John: I realized last week that I had used input files that contained a 10 um offset for the calculations below, That placed the incident beam right at the edge of the 20 um diameter SiO2 inclusion, which explains the odd reults as thye distance between the SiO2 and TiO2 incusions (in SiO2 matrix) were decreased. So after re-running the calcualtions over the weekend, I have edited this post for the correct results and will follow up with a summary post. Sorry for the confusion! 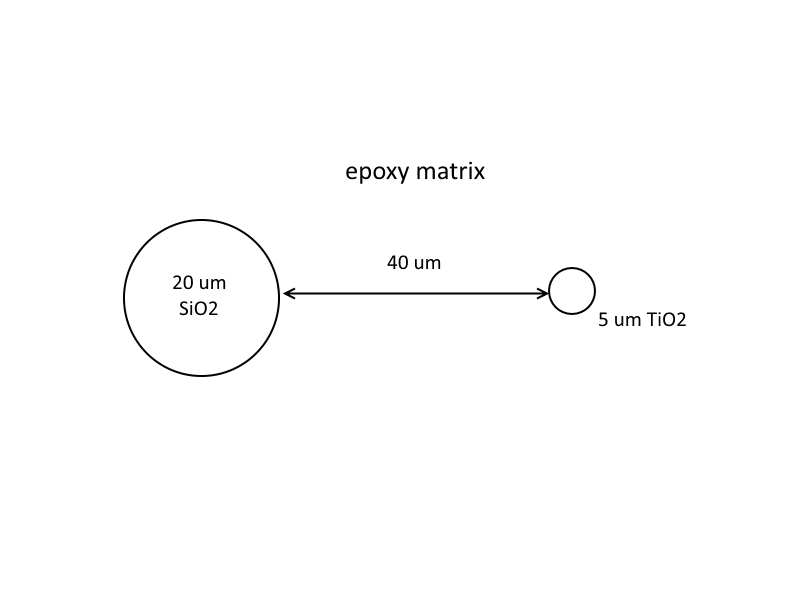 So the SF effect is slightly more pronounced when the SiO2 inclusion and the TiO2 inclusion are separated by epoxy when compared to an SiO2 matrix, and this makes sense since the absorption of continuum x-rays which are of sufficient energy to excite the Ti K edge are less absorbed in epoxy than in SiO2.